Happy Valentine’s Day! Well, maybe not so much… Molly Sutton’s B&B is jam-packed for the holiday, but whatever romance is in the air is quickly snuffed out when somebody turns up dead. In addition to worrying that one of her remaining guests is a killer, Molly’s not feeling tip-top and spends more time napping than sleuthing. That’s no way to catch a murderer! 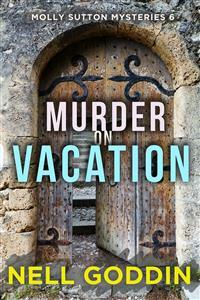 Murder on Vacation is the sixth book of the Molly Sutton Mystery series. (Each mystery is standalone, though the relationships develop over the course of the series.) If you like page-turning cozy mysteries, rich characters, and a peek into French village life, you'll love Nell Goddin's tale of murder and duplicity. For a free short story set in Castillac, click here! For my generous father, C. Hobson Goddin, for sticking with me even when he thinks I am nuts. The second week of February, cold and damp. Molly Sutton stood looking out the French doors of La Baraque at the frosty landscape, struggling with the feeling that she should be a lot happier than she was. She stood at the window looking out, and moping. Eventually Molly decided some company might help her out of her funk. So she bundled up, gave Bobo a pat, and hopped into her new Citroën coupe since it was too cold to use the scooter. The car had been a total splurge—and a silly one at that—since she didn’t actually care all that much about what kind of car she drove. There was something about suddenly being rich that had made her lose her head for just a bit, and the car was the least of it. La Baraque now had three new guest rooms in a formerly dilapidated wing off the main house where she lived. A swimming pool was being put in, with work beginning next month. Her bathroom had been renovated to a level of luxury that sailed right past “lap of” and landed a little over the top. Next month, a part-time gardener was due to start work. While all these things were delicious in many ways—and to be honest, she didn’t regret a single one of them—she nonetheless woke up every morning and, well, there she was. Same Molly, with the same ungovernable tangle of red hair, the same yearning for motherhood, the same uncertainty in the area of romance, and the same pants that were getting too tight. She reminded herself on the ride into the village that it’s not exactly charming to complain about how coming into a sudden windfall isn’t as transformative as you thought it would be. After parking, she took a moment to look inside the big window of Chez Papa, the bistro that had become her second home in Castillac. She was friends—as everyone was—with the shaggy-headed owner, Alphonse, and knew she could count on knowing at least one person if she dropped by for a meal or a drink or a quick plate of frites. That night, to her relief, her pal Lawrence sat on his usual stool, drinking his usual Negroni. He grinned when he saw her looking through the window. “Trying to catch us up to no good?” he asked with a twinkle in his eye as she came inside. Nico, the bartender, and his girlfriend Frances—Molly’s best friend from home—had taken off for a month in the Maldives. Molly picked up a bucket and the vacuum cleaner. “Let’s hit the cottage first,” she said. They didn’t bother putting on coats for the short walk over. The heat was only set at fifty degrees since no one was staying there, and they shivered as they came inside. “Oops, sorry about the heat.” Molly sat down on the sofa and stared into space. Molly looked at her vacantly as though she had lost the ability to understand French. “It’s Valentine’s Day. They’ll be busy with each other,” said Constance with a wink. “Oh please, let that be true,” Molly muttered to herself, after thanking her friend and heading back to her house and bed. For once, she thought, let there be no drama. Just an easygoing crowd that gets along and needs no hand-holding. She climbed into bed, and lacking the energy or commitment to protest when Bobo curled up next to her, fell fast asleep. After a long nap followed by ten solid hours of sleep, Molly felt refreshed on Saturday morning and ready to face the influx of guests at La Baraque. She decided to skip the market—a first since moving to Castillac almost a year and a half ago—and instead made the rounds of all the guest rooms, making sure each was spotless and stocked with a welcome bottle of wine, along with a small booklet with suggestions for sight-seeing, restaurant recommendations, and some emergency phone numbers. All in all, her gîte business was much more settled than it had been even six months earlier. The income was not substantial but it was steady-ish and improving. Molly now knew what to expect and felt ready for the odd questions guests sometimes came up with. And most important—she really liked doing it. The plumbing repairs, greeting guests and getting to know them, making improvements at La Baraque…there wasn’t any part of the business that Molly minded, and most of it she thoroughly enjoyed. Valentine’s week was going to be a challenge, however. Fully booked, which at this point meant six guests: two couples and two singles. Darcy and Ira Bilson were due early Saturday morning; they had been traveling in the area and asked if they could check in early, which was fine with Molly since she had no guests currently in the cottage and the cleaning was long since done. By nine o’clock, Molly was up and caffeinated, expecting the Bilsons to show up any minute, and the rooms were all double-checked and ready. Lately she’d been having a bowl of fruit in the morning instead of her usual croissants, not so much from any grand ambitions of self-improvement and control, but more for a change of pace. It had taken months to get over her habit of shoving food into her mouth while standing by the sink (or in front of the open refrigerator) instead learning to follow the French way, really taking time to make the meal an event even if she was eating by herself. She sat at the table and sliced an apple into pleasingly thin and symmetrical slices. The orange cat streaked through the kitchen as though on a crucial mission from Satan, prompting Bobo to jump up in hot pursuit. After polishing off the apple and her second cup of coffee, Molly got up to toss a few more logs into the woodstove. She heard a car pulling into the driveway. Slipping on a coat and grabbing a wool hat, she went quickly outside to greet the new guests. “Ah, we are thrilled to be here. Just thrilled! We’re coming from three days at an organic farm north of here, not far from Limoges,” said her husband as he came to shake Molly’s hand. He was a big bear of a man, and stood with his chest expanded and hands on hips. His blond hair was shaggy and looked as though it hadn’t seen a comb in a few days, and his eyes were red, perhaps from the strain of traveling. “Is there an extra charge for that?” asked Darcy. Darcy gave a brief nod but did not soften her expression. Although she was only thirty, a deep furrow had been carved between her eyebrows. “Let’s go! Er…is that what you want to do, lovey?” he asked his wife. Darcy sighed and shrugged again. “All right,” she said, her tone one of deepest martyrdom. Ira opened his mouth to speak but closed it again. Darcy looked out of the window and said nothing. The Bilsons answered at the same time, with Ira wanting Molly’s company and Darcy wanting to be without her. Darcy won, which did not come as a complete surprise to Molly. She pointed to the section of the market where the cheesemonger usually set up, and fled for the Café de la Place. “Pascal!” she said, slipping into a seat on the glassed-in terrace where a small heater was set up. The model-handsome server grinned and asked her how she was doing. “Fine, thanks. But I’ll be even better if you’ll bring me the Special.” Pascal winked and disappeared into the kitchen. Molly was known in the village for her passion for French pastry, and croissants in particular. The café got theirs each morning from the best pâtisserie in the entire département—Molly’s holy of holies, PâtisserieBujold. In less than a minute, Pascal was back with the Special on a tray: a large cup of steaming café crème, a tall and narrow glass of freshly squeezed orange juice, and a croissant on its own small plate. Molly sipped the coffee and thought about the Bilsons. One crabby spouse whom the other constantly tried to appease—was that a workable arrangement? Were they happy like that, or was Darcy on the verge of leaving because Ira never quite managed to mollify her? Or was Ira on the brink of storming off, having had enough of his impossible wife? Molly’s own marriage had ended years ago, but she reflected that she and Donnie had always seemed to get along, on the surface at least. They hadn’t revealed anything like the public tension of the Bilsons. Yet what had that mattered? They had split up anyway, and Molly no longer regretted it, not now that the whole painful thing was far in the past. The orange juice provided the perfect mixture of tart and sweet, and after drinking most of it, she turned her attention to the croissant. Leaving all ruminations on marriage behind, she bit into the slightly hard tip, the crunch so buttery and satisfying, and then another quick bite to reach the soft, stretchy inside that tasted vaguely of cheese (even though she knew there was no actual cheese involved). She couldn’t help eating the whole thing more quickly than it deserved. As she lingered over her coffee, reminding herself to pick up two other guests that afternoon at the train station, the Bilsons entered the café and sat down behind her. Molly started to speak but they did not appear to notice her, so she turned back around and edged her chair a bit closer, never one to pass up an opportunity to eavesdrop. Not long after returning to La Baraque, two more Americans showed up: Ashley and Patty, two women from South Carolina who were celebrating Ashley’s recent thirtieth birthday, and were staying in the renovated pigeonnier. “I completely understand,” said Molly with a smile. Ashley was medium-height and curvy, with an impressive bosom and small waist that Scarlett O’Hara would have envied. She wore a pile of bangles on each arm, trendy ankle boots, and an eye-poppingly pink dress. Her blonde hair came from a cheap dye job, Molly noticed, not judging her for it. Ashley’s friend, Patty McMahon, did not hug. She smiled uncertainly when Molly welcomed her, looking embarrassed. She was very short, her pale skin scattered with freckles, brown hair in a long pixie cut. She dressed so plainly in jeans and a flannel shirt that Molly wondered what the two women had in common. “So, how did you meet?” she asked. “Afraid not,” Molly shook her head. “Now Patty here?” Ashley continued. “She was a gift from God, I will tell you what. You’ve got to understand, if the girls catch you cheating on one of the tests, you’re out, out out! And I…well, I was cheating. I just couldn’t wear those hideous shoes everywhere I went. What would people think? And so one day I was walking to the sorority house wearing this pair of platforms that made my legs look like Elle McPherson’s. I was planning to switch shoes when I got close, you see? But Lord Almighty, here comes a sorority sister (and not one of the nice ones either) and I thought, Damn it all to hell, my goose is cooked! “True enough!” said Molly, leading them to the pigeonnier and getting them settled just in time to go greet the next guest, Nathaniel Beech, dropped off in the driveway by Christophe, the taxi driver. Nathaniel looked lost, his gangly arms dangling at his sides, carrying his belongings in a high-tech backpack. “Nathaniel,” he answered, looking a bit alarmed. Nathaniel and the other single man, Ryan Tuck, were staying in the newly fixed-up wing off the main house. The rooms had en suite bathrooms, but no kitchens, and thanks to Molly’s suddenly fat bank account, the beds, linens, and everything else were of very good quality. “Depends on which part you’re talking about,” Molly laughed, pleased that he was taking an interest, and also pleased, if she were honest, to gaze on Ryan’s chiseled features and buff body. He was wearing a rather tight T-shirt that showed off his muscles, and had dark brown hair cut short enough to stick straight up. Definitely an attractive guy, and with several single women at La Baraque, and Valentine’s Day coming up, Molly thought there might be some interesting developments ahead. After getting Ryan settled, Molly sneaked off to her bedroom for a breather. As much as she loved meeting new people, being responsible for the happiness of six guests all by herself felt a bit much at the moment. It was a dreary day with no sign of the sun, and her bedroom, far from the woodstove, was chilly. She pulled her new down comforter up to her chin, reached for her tablet, and dove into a new book. After an hour of escaping to thirteenth-century England, she heard Bobo barking and got up to see what the dog was excited about. Glancing out a window in the hallway, Molly saw Ryan Tuck playing fetch. Bobo was dancing on her hind legs, waiting, and when Ryan threw the stick, she took off like a shot. Molly smiled. Of course, it was not at all the same as having a family, but still, it was very nice to have new acquaintances coming and going, and to see, in the short time they were there, they formed a sort of community. And she was, of course, always disposed to like anyone who made friends with Bobo. It was 5:30 and time for a kir. She wandered into the living room, shoved another log in the stove to take the chill off, and reached for the bottle of crème de cassis. A knock on the French doors. “Hey Molly?” said Nathaniel through the glass. Nathaniel’s cheeks got very red and Molly almost teased him but figured she didn’t know him well enough. She put a kir in front of him and lifted her glass for a toast. “To Miranda!” she cried. Banging on the front door. “Hold on, maybe someone else is thirsty,” she said. The Bilsons barged in as soon as Molly opened the door. “Bonsoir!” boomed Ira, laughing at his terrible accent. “I’ve found people here to be really wonderful,” said Molly, unsure how she felt about an extended Bilson stay. “As long as you aren’t killed,” sniffed Darcy. “Last few months, more like,” said Darcy, with curled lip. “But no worries, Ira and I can take care of ourselves. I was wondering, can you recommend a place for dinner?” asked Darcy. Ira was staring at Molly’s refrigerator as though it were his only hope of survival. Molly rummaged around in her cupboards and refrigerator; within ten minutes she’d put a tray of gougères in the oven, and placed a bowl of olives and one of marinated artichokes on the counter. Ryan grinned and saluted, and said he’d be glad to if she was willing to take the risk that he wouldn’t run off with the entire tray for himself. “I’ll keep an eye on you,” said Ira seriously, appearing to take Ryan’s joke literally. Grabbing her kir, Molly stepped out through the French doors and started down the path toward the pigeonnier. She breathed in deeply, enjoying the briskness of the cold air in her lungs, feeling a little happier now that her house was filled with people. Impulsively, she pulled out her cell and called Ben. “Hello, Molly,” he said, his voice soft. Ben paused, just for a millisecond. “I can’t promise that the guests all get along,” Molly continued. “But still, it’s—” she was about to say “more fun than sitting home reading Napoleonic sea tales,” but thought the better of it. “On my way,” said Ben, and Molly hung up, grinning like a schoolgirl. Molly went around to the pigeonnier to invite Ashley and Patty. Every time she looked at the building, she remembered Pierre Gault and admired the exquisite work he had done. There’ll never be his equal when it comes to stonework, she thought. Ashley was talking so loudly that Molly did not have to rely on her eavesdropping superpowers to hear what she said. Was this going to be the Week of the Grouchy People? And I’m right there with them, she admitted to herself. Patty shrank back as though she wanted to be invisible, and Molly instinctively gave her more room. “I do all the talkin’ around here!” laughed Ashley, fluffing up her hair. “We were planning to have dinner in the village,” said Patty. When she came back to the main house, she heard Darcy laughing uproariously, and Ira looking on as though he didn’t get the joke. “Ryan, you are just too funny!” Darcy said, her face now relaxed and open, her eyes even twinkling. Molly noted how a funny person would change the mood of a room in a blink of an eye, and she was grateful for Ryan’s good humor. She bent down to peek in the oven, which was temperamental, sometimes disobeying the temperature controls and burning things to a crisp if she didn’t keep an eye out. “What are those delicious-looking morsels, anyway?” asked Ryan, standing at her elbow when she stood back up. Ryan looked at her with alarm. “Sorry! Something about you makes me want to tease you.” She laughed and took a sip of her kir and they looked at each other warmly and smiled. “Darlings!” said a loud, Southern-accented voice, and everyone turned to see Ashley posing in the doorway with her arms open wide. “I want to know all of your names, starting with you!” She looked at Nathaniel and winked, and he stuttered out his name and moved away. Ashley spotted Molly in the kitchen and walked over with an exaggerated sway like she was on a Paris runway. “And who is this handsome specimen?” she said to Ryan, who introduced himself. “That sounds like a different Ryan Tuck,” he laughed, and Ashley shrugged and sat down next to Ira, whispering in his ear. Patty looked down at the floor, and Molly went to her quickly and asked if she would like a drink. Before Patty could answer, Bobo barked and Molly excused herself to go to the door. “Ben!” she cried, and fell into his arms as though he had been away on another long trip. “Well, bonsoir to you too,” Ben deadpanned, hugging her tightly for an instant before letting her go. “I see you have a full house,” he added. “I know, you’d probably rather be home in bed reading. But I…I just wanted to see you. To be with you,” she said, quietly so no one could overhear.